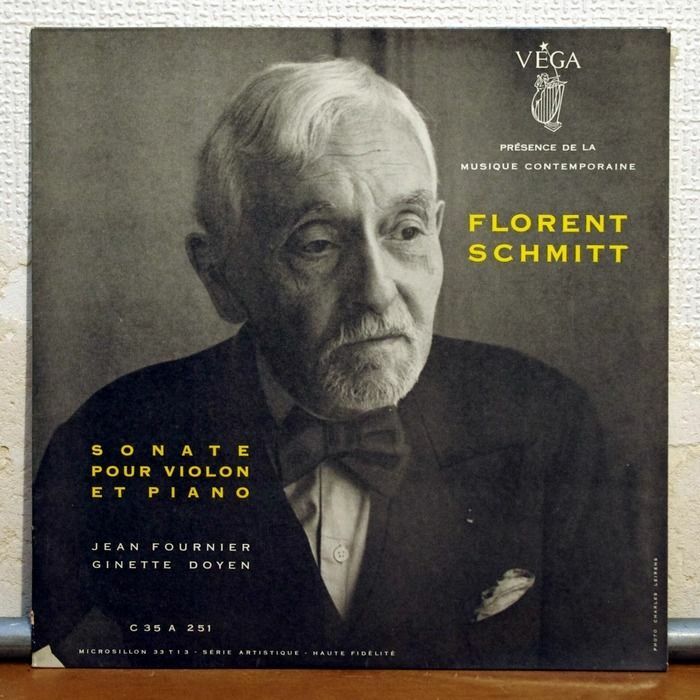 Within Florent Schmitt’s musical output are a half-dozen works that feature the violin. Perhaps the most significant of them is his Sonate libre, Op. 68, a work he composed in 1918-19 at Artiguemy, his country retreat in the Hautes-Pyrenees. First recording: Jean Fournier and Ginette Doyen (1959). The formal title of the music is a real mouthful: Sonate libre en deux parties enchaînées, ad modem Clementis aquæ. Evidently, Schmitt was using a play on words in the title – a reference to French Prime Minister Georges Clemenceau’s newspaper L’Homme libre which later became known as L’Homme enchaîné. 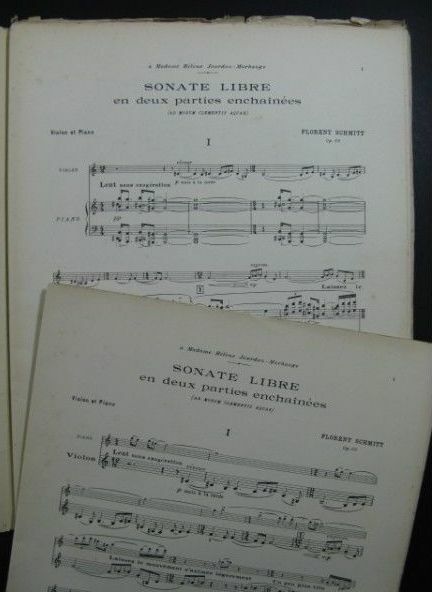 A vintage copy of the Sonate libre score by Florent Schmitt (1919). He likens the style to Olivier Messiaen’s early works that were to come along a number of years later. I agree with Duteurtre’s sentiments. This is a lengthy sonata: a half-hour long, two-movement work that exploits the full range of sonorities, with a magnificent rhapsodic interplay between the violin and piano in the first movement, titled Lent sans exagération. In the second movement that follows without a break – titled Animé – we are treated to completely different atmospherics. The piano-only introduction tells us immediately that this is the Florent Schmitt of sass and irony, replete with nervous energy and spikey rhythms. The two movements are vastly different … yet they do seem made for one another: two sides of the same mirror casting different reflections, as it were. 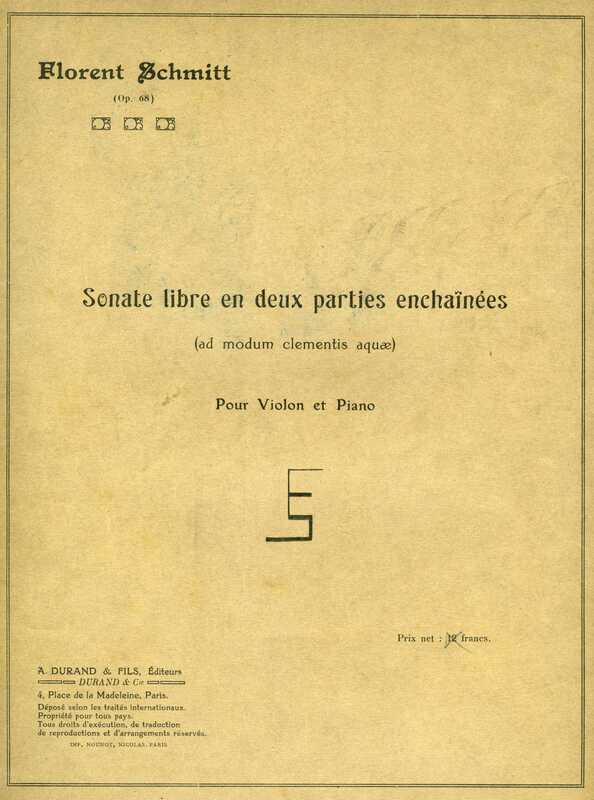 The score to Florent Schmitt’s Sonate libre en deux parties enchaînées, ad modem Clementis aquæ, completed in 1919. When the piece was premiered in Paris in March 1920 at a Société Musicale Indépendante concert (performed by violinist Hélène Léon and pianist Lucien Bellanger), it was warmly received. For such an interesting and important composition, it may be surprising to learn that there have been only two commercial recordings made of this music — although a third one is scheduled to be released in the United States in April 2014 (featuring violinist Ilona Then-Bergh and pianist Michael Schäfer) on the Genuin label. The first recording was made by the husband-and-wife duo team of violinist Jean Fournier and pianist Ginette Doyen in 1959 for the French label Véga, which issued the Sonata on a 10” LP. 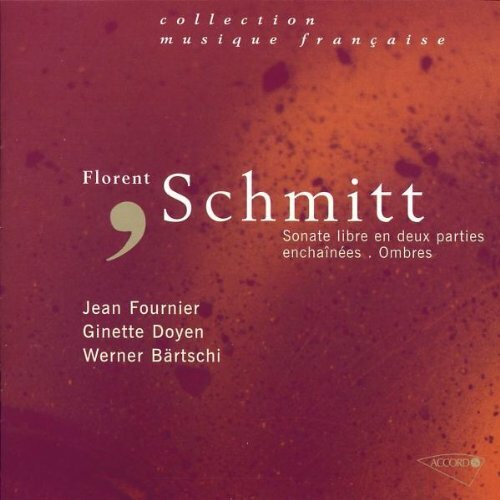 The premiere recording of Florent Schmitt’s Sonate libre with Fournier and Doyen has been reissued on CD (on the ACCORD label). More than 30 years would go by before the second recording of the Sonate libre was made, by violinist Régis Benoit and Franco-Turkish pianist Huseyin Sermet. It was recorded in 1992 and released on the Valois label. This 1992 performance of Schmitt’s Sonate libre by Régis Benoit and Huseyin Sermet is a brilliantly conceived interpretation. For clues as to the musical challenges the Sonate libre poses to musicians, the words of violinist and conductor John McLaughlin Williams are instructive. He and pianist David Riley tackled the work back in the mid-1990s, performing it at the Cleveland Institute. 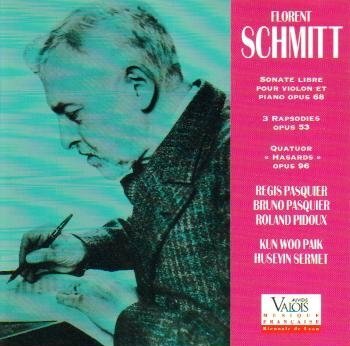 … All of which serves to show us the musical riches that await the listener when hearing Florent Schmitt’s Sonate libre. Give it a whirl; I think you will find that this is a half-hour of time well-spent. 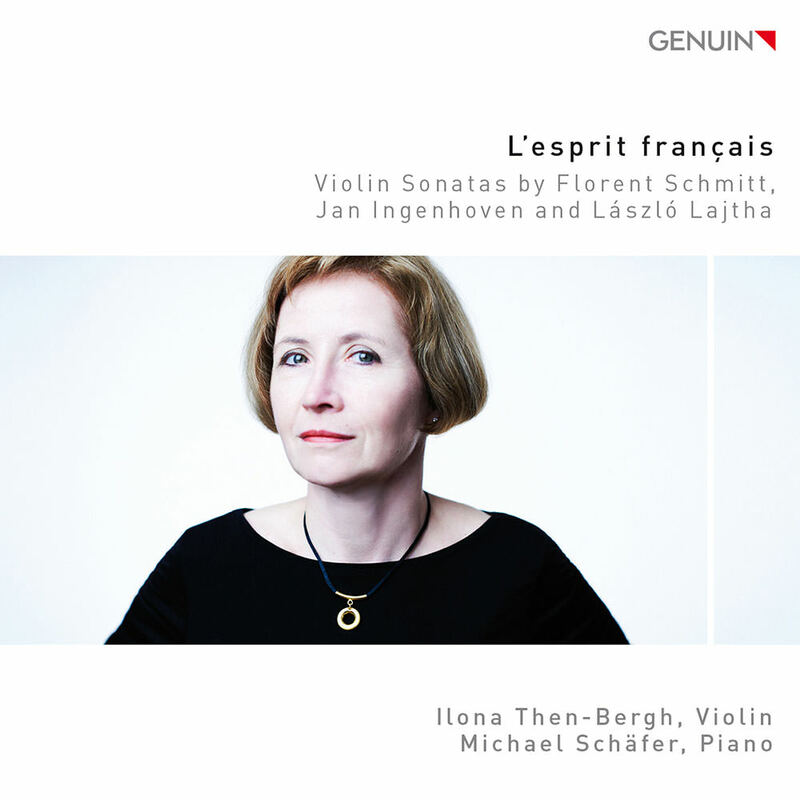 The 2014 Genuin recording of Florent Schmitt’s Sonate libre also contains violin sonatas by Jan Ingenhoven and László Lajtha. 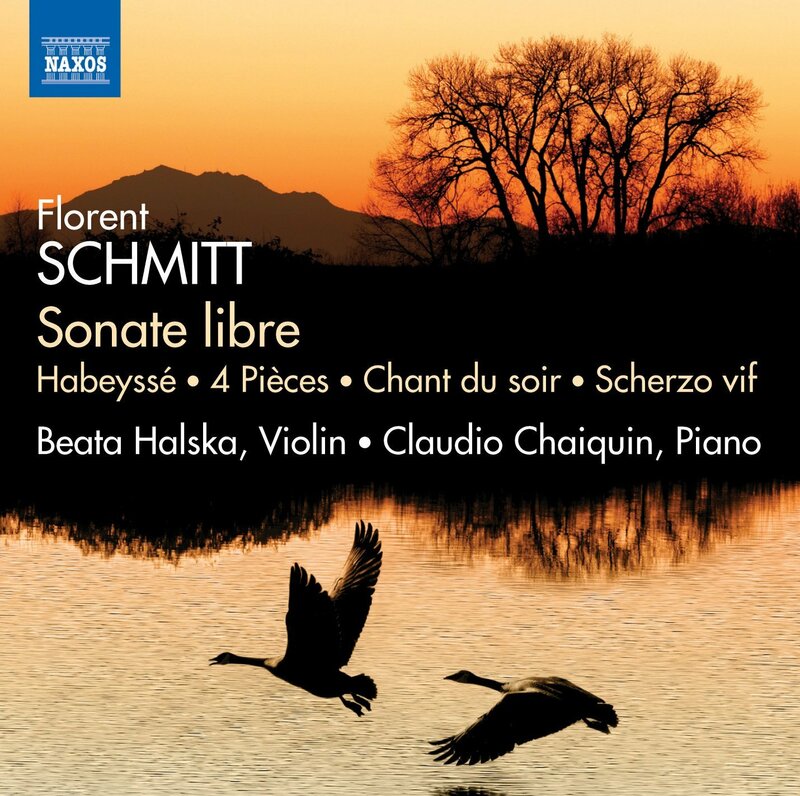 Update (1/5/15): In more recent years, Florent Schmitt’s Sonate libre has received two additional recordings — both of them released in 2014. Violinist Ilona Then-Bergh and pianist Michael Schäfer have recorded Schmitt’s Sonata on the Genuin label, while violinist Beata Halska-Le Monnier and pianist Claudio Chaiquin recorded their interpretation with the NAXOS label, coupled with other music composed by Schmitt for violin and piano. I was privileged to have the opportunity to interview Miss Halska and Mr. Chaiquin shortly after the release of their NAXOS recording. You can read their insightful remarks about the Sonata plus other works by Florent Schmitt for violin and piano here. This entry was posted in Chamber Music, Classical Music, Composers, French Composers, Uncategorized and tagged Beata Halska, Benoit Duteurtre, Chamber Music, Classical Music, Claudio Chaiquin, David Riley, Florent Schmitt, French Composers, Georges Clemenceau, Ginette Doyen, Henri Dutilleux, Huseyin Sermet, Ilona Then-Bergh, Jean Fournier, John McLaughlin Williams, Jonathan Woolf, Messiaen, Michael Schafer, MusicWeb, Nones, Regis Benoit, Roland-Manuel, Schmitt, Sonata libre, Violin Sonata. Bookmark the permalink. « Introït, récit et congé: Florent Schmitt’s tour de force for cello and orchestra (1948).